Just in time for summer and beach time! 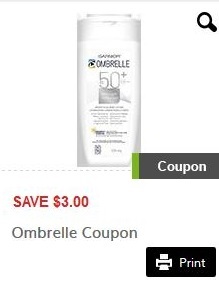 Here’s a coupon that I found to save money on sunscreen the next time you pick up a bottle of Ombrelle, you can save $3 with this printable coupon. Ombrelle Sunscreen is good because when you apply it, it goes on clear. You no longer have these white stains and white cream all over your body. Printed coupons are the best because you can print them directly from your own printer. No need to wait for them to come in mail anymore. Go to GoCoupons.ca and this is what you will see. You will click on ‘print’ and need to sign in. This coupon is valid only in Canada. Discover Ombrelle’s moisturizing SPF 60 sun protection. Dermatologist recommended. This non-greasy and fast absorbing formula provides broad spectrum photostable protection against UVA & UVB rays. 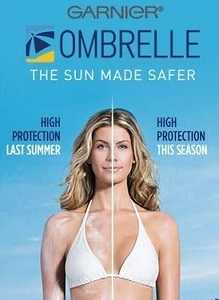 Ombrelle has many different lines of sunscreen and there is definitely a line that will fit you. You can choose from Ombrelle Ultra Light Advanced, Ombrelle Kids, Ombrelle Complete, Ombrelle Sport and Ombrelle Face. Check out Garnier.ca for more details about which Ombrelle sun product is perfect for you.